Ojibwa is an Algonquian language, closely related to the tongues of the Ottawa and Algonquin tribes. The Ojibwa are also know as the Chippewa. 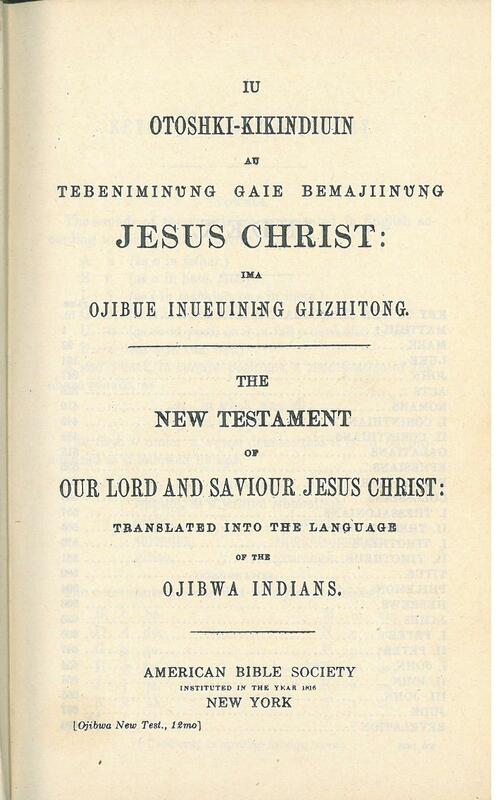 Ojibwa was the fifth Native American language to have a printed New Testament (1833). Contents: New Testament, The 10 Commandments and a hymn are printed after Revelation. Description: Octavo (184 mm), p. 484. Text in a single column with each verse set as a separate paragraph. References: Book of a Thousand Tongues (1972) entry 1005, Darlow & Moule 3025. 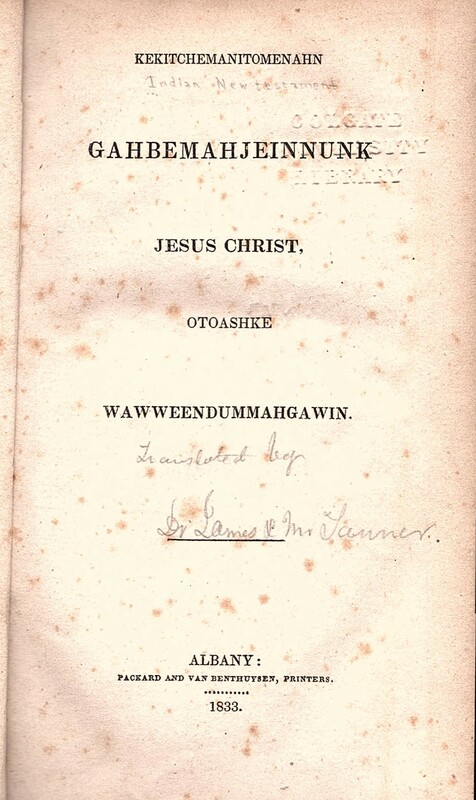 Title: Iu Otoshki-Kikindiuin au Tebeniminung Gaie Bemajiinung Jesus Christ: ima Ojibue Inueuining Giizhitong — The New Testament of Our Lord and Saviour Jesus Christ: Translated into the Language of the Ojibwa Indians. Contents: New Testament (Possibly a reprint of the 1844 New Testament). References: Book of a Thousand Tongues (1972) entry 1005, Darlow & Moule 3032. Translated by Peter (Kahkewaquonaby) and John (Thayendanegan) Jones, Ojibwa Indians employed by the Methodist Episcopal Mission. translated by Edwin James and John Tanner, who had worked for 30 years with the Ojibwa in official capacities. Translated by George Copway (Kahgegagabhowh), and Ojibwa Chieftain and Sherman Hall, a Baptist missionary. Translated by Frederick A. O'Meara, Society for the Propagation of the Gospel. Translated by Robert MacDonald, Church Missionary Society. The Psalter in his translation was published in 1886 by SPCK, Winnipeg. Translated by John Horden and J. Sanders, Church Missionary Society. — From The Book of a Thousand Tongues entry 1005.